Could this be Van Dyck’s fingerprint? 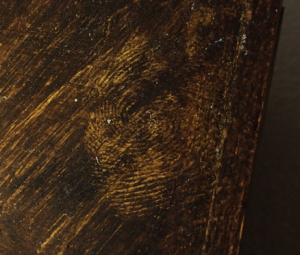 There is a prominent fingerprint in the top right corner of Van Dyck’s painting of Thomas which we examined yesterday. Could this be the fingerprint of the Master himself? The print has been made in the wet paint before the application of the varnish. 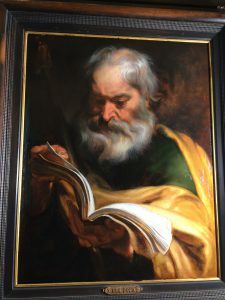 It would have been extremely unusual for a studio assistant to touch or move the Master’s work before the paint had dried and the varnish applied. So there is the intriguing possibility that this is Van Dyck’s print. We would like to find more fingerprints on Van Dyck paintings for further comparison – let us know if you know of another one! How to cite: Vander Auwera, Joost and Davies, Justin. “Could this be Van Dyck’s fingerprint?” In Jordaens Van Dyck Panel Paintings Project.